waistline only, and eliminate the waist darts; then reduce 1/2″ at sides of waistline, and draw curved outline in front as shown by dotted lines. Instead of the 1/4″ ease on back shoulder seam, make a dart, 1/2” wide and 3” long, at center of shoulder seam; then add 1/4″ to shoulder at armhole. For bottom of back, make 1-1/4” wide facing. A to B – Equals back of neck (from shoulder seam to center back). Square this line up from shoulder line. 4) – B to C – 1/2″; then connect from A to C.
5) – C to D – 2-3/4”. This equals 1-1/4” for stand of collar at center back, plus 1-1/2” for turn back; then square at point C.
ontinue the line slightly curved to edge of front as shown by dotted line. 7)- Draft facing as indicated, making facing 1/8” wider and 1/8” longer at center back as shown by dotted lines. To complete the pattern, add seams on all sewing edges. half way between the dart and side seam as shown by dotted lines. For closer fit front (just below the bust), make the waist dart 1/2″ wider, about 5” above the waistline; then extend the dart up to the level of the side dart as shown by dotted lines. A sleeveless dress is usually closer fitting around bust (about 2”). 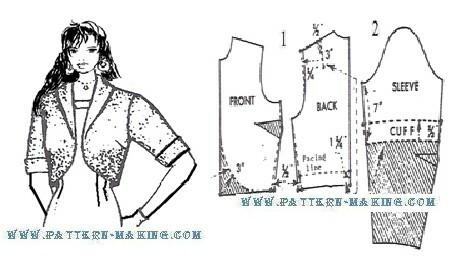 Therefore, reduce 1/2″ at upper part of each side seam; then raise armhole 3/4″ as shown by dotted lines. 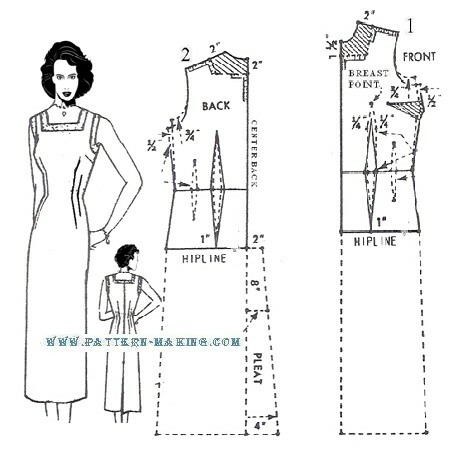 Draft squared neckline as shown by dotted lines. Dress length equals the prevailing style length. Width of front equals the front width at hipline, plus 1”. The same applies to the back. Add a kick pleat at center back as shown by dotted lines. Pleat is stitched to 8” below hipline along center back and across the pleat (see sketch). To complete the pattern, add seams and a dress hem.